What’s wrong with this picture? NOTHING. 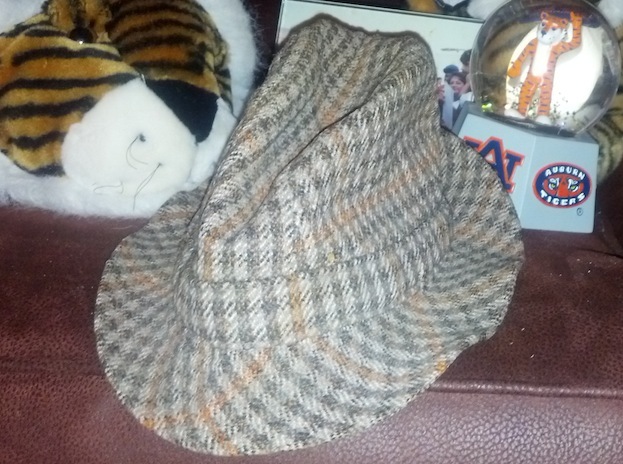 Kathy Moates’ most prized piece of Auburn memorabilia is a houndstooth hat. Each fall, she takes it out of her closet, dusts it off, and places it on her coffee table, where it stays all football season long. It’s the centerpiece to her living room’s Auburn decor. Folks come over for games. They look down. They look back up. “I thought y’all were Auburn people.” Kathy laughs and tells them the story. She got the hat at the 1969 Iron Bowl, Auburn’s first win over Bama in five years, Bear Bryant’s worst defeat ever. It was a crazy game. Auburn players were faking punts from their own goal line on a whim. Auburn students were running onto the field to kneel and shout “hallelujah” when the fake punts turned into touchdowns. People were writing songs. Even Shug let his hair down. Fedorable: Kathy Owsley and Bobby Moates (AU ’71) at the 1969 Iron Bowl, before the game. They were on a date. They eventually got married. Photo taken from the Legion Field press box by Robert “Scoop” Owsley, Kathy’s father. And in that moment, Shug Jordan’s houndstooth hat became, for a time, the most famous houndstooth hat in Alabama, maybe even the country. In 1969, that houndstooth hat across the state—and likely across the field that day—was still several years away from iconic status. According to a January story in the Birmingham News, Bear Bryant didn’t start wearing a houndstooth hat until he was given one that year (or possibly 1968) by a Birmingham tailor; any “houndstooth” hat you may see before then is merely checked, the tailor claims. Of course, judging by a photo of Bryant in a houndstooth hat at the 1968 Cotton Bowl on New Year’s Day, Bear would have had to have been no later than 1967. 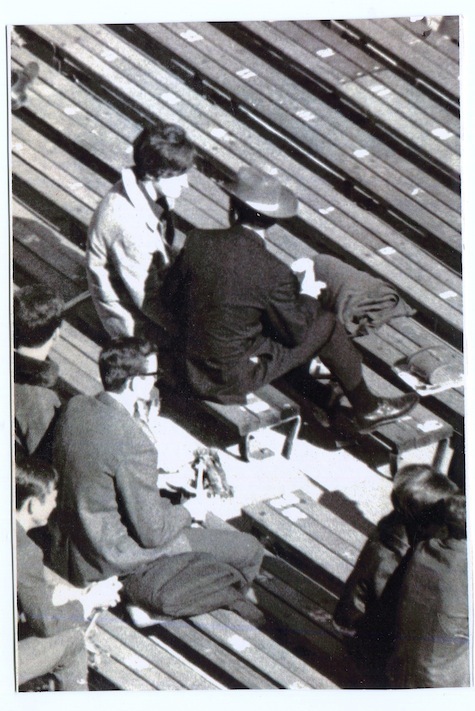 But Shug had also been wearing his houndstooth headpiece for at least a couple of years, often at games; there are several shots of him wearing or holding it on the sidelines in the 1969, 1970, and 1971 Glomerata, not to mention that Golden Flake ad. And no one batted an eye at the pattern choice. No one thought copycat—there was no cat around to copy, except for maybe Shug himself, who according to his daughter regularly hit up Brooks Brothers in New York City for all manner of houndstooth apparel. He had purchased this particular fedora overseas in 1967. And it meant a lot to him. He was still mourning the loss during the next day’s Auburn Football Review—he guessed he’d just have to break in a new one for Auburn’s game against Houston in the Astro-Bluebonnet Bowl—but he needn’t have. Moates had already contacted the athletic department to schedule the hat’s homecoming. And shanks to her dad, longtime Opelika-Auburn News reporter Robert “Scoop” Owsley, a camera was there waiting to snap a shot for the AP wire when she did. 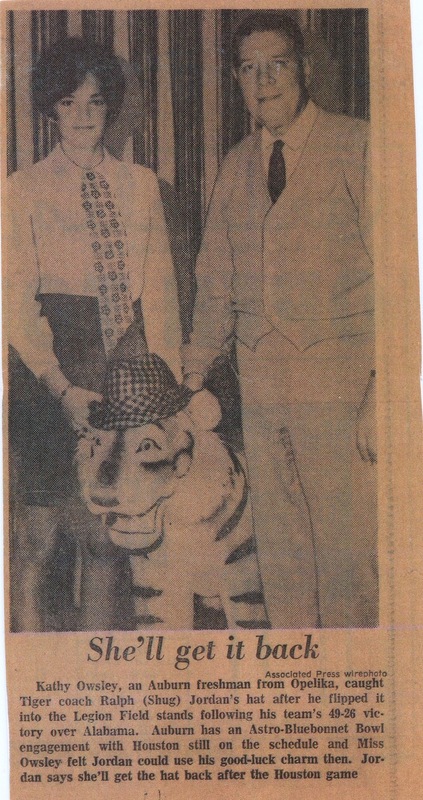 For Auburn fans living in today’s world of Bama Twins and that dude with the giant Bear Bryant back tattoo, the photo that soon appeared in newspapers across the country–“It was as viral as viral could go back in ’69,” Moates says–of legendary Auburn coach Shug Jordan and an Auburn coed posing beside a grinning stuffed tiger wearing a houndstooth hat is worthy of double takes, triple takes, quadruple takes, takes infinity. But in 1969, it wasn’t a photo of a houndstooth hat–it was just a photo of a hat, Shug’s hat, and every Christmas card Moates received from an Auburn fan friend that year came with a clipping of it… probably accompanied with a “congrats,” because the caption concluded with “Jordan say she’ll get the hat back after the Houston game.” And she did. War Eagle. 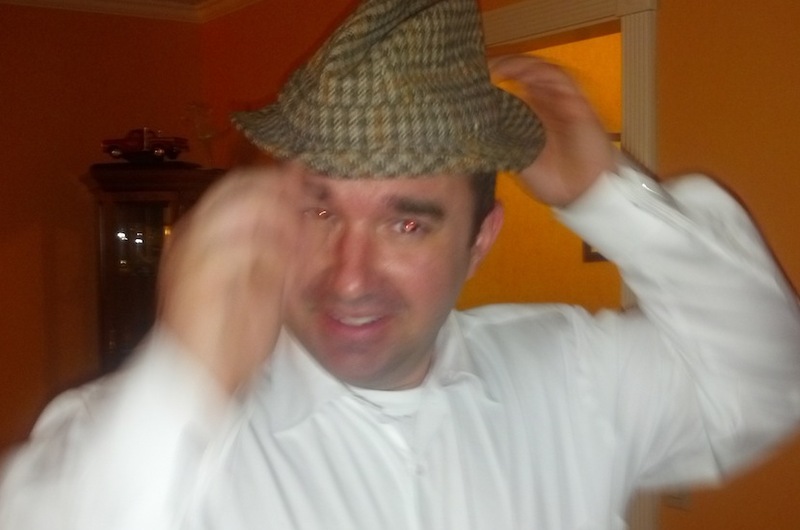 Kathy Moates’ son Patrick modeling The Hat in 2013. He was named after 1969 Iron Bowl star Pat Sullivan. 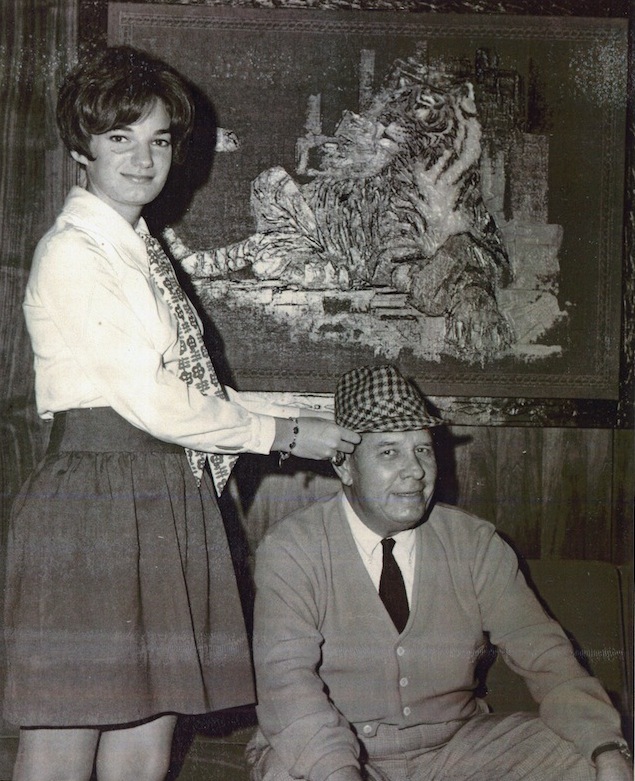 Related: More new, old photos of Shug and his houndstooth hat. THE WAR EAGLE READER NEEDS YOUR HELP. The hat pictured is not the same one in the photos with Shug. The pattern on the band is diagonal on the original hat. Not so on the more recent photos. This is more of a gingham pattern, not Houndstooth. J, it’s definitely been even more ‘battered’ over the past 46 years, and I think that’s blurred the pattern a bit, but the stuff up top looks pretty houndstoothy. Of course, only one of the hats shown in the al.com story about the origin of Bryant’s hat is actually houndstooth. Shug’s hat is like the one pictured in the bottom picture. Look at the band around the base. Keep these great feature stories coming. They make TWER what’s it’s all about! well now…. i believe Shug wore it first…. It’s funny how things are always so competitive yet AU is normally on the losing end. Obvious Shug isn’t known for wearing houndstooth, while Bear is. It’s more of a remembers nice piece rather than a Vogue magazine of “Who wore it first”. No story here just AU fans trying to put a W in the column of anything they can grasp like straws to. Leave it to Auburn, to again, try to compare themselves to Alabama. Will it ever stop? Ewe – would NEVER want to “compare” to Alabama! Winning football games isn’t everything. Living with humility, respect, not being obnoxious, being respectful, and actual better education will always make AU the best!